We’re excited for the final market of the 2018 season and this week’s featured vendors. Come out and hear Royce Johns in the music tent, too. 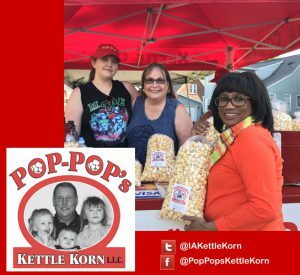 POP-POP’s Kettle Korn is a market favorite, and among the longest vendors in Beaverdale. John and Mary take pride in the quality of their kettle korn: it’s Iowa grown popcorn, popped light to perfection and not too sweet. It freezes well so you can enjoy it far past market season. Keep up to date with their schedule on Facebook @PopPopsKettleKorn or on Twitter @IAKettleKorn. Joe’s Creations joined Beaverdale Farmers Market for his first year, bringing custom woodworking pieces. Joe is an experienced woodworker and likes to repurpose metal and wood items. He makes games, decor and one-of-a-kind furniture. 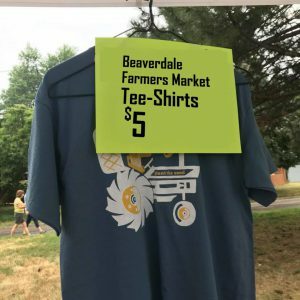 T-shirts $5 at the last market!